There is a plethora of companies that provide us with are beloved Teas though there are only a select few that can meet the luxury standard. The great thing about drinking one of the best luxury tea brands is that you don’t have to break the bank to do so. In fact, some of the best tasting and high-quality teas out there are also very affordable. Below are my top 5 favorite brands of tea. I will give my thoughts on each of them and why exactly they have made my top 5 list. Also, for each I will describe my favorite flavor and what makes it so special. 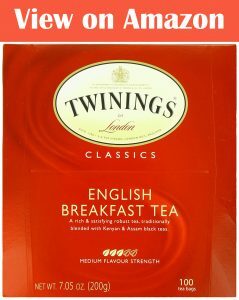 Twinings are a well-known tea manufacturer all around the world. I personally enjoy their English Breakfast option. Basically, these tea bags have an amazing taste and body to them that most other brands struggle to replicate. Also, when you buy them each and every bag is individually wrapped which helps keep them fresh and stops the tea bags drying out and losing the flavor that the leaves give them over time. There are also readily available and are also very affordable. Harney and Sons have an amazing reputation for mastering tea and getting the most interesting and tasty flavor combinations in tea. 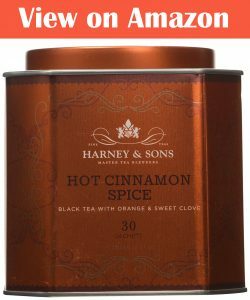 For me personally I love the hot cinnamon spice option which is surprisingly sweet even though no sugar has been added. Even myself who has a bit of a sweet tooth didn’t have to add any sugar or sweetener as the flavor is amazing and has a natural sweetness from the cloves and orange which help make up part of the flavor. If you want to go to the next level of luxury you can get the Tea Tin which includes 30 of the Cinnamon bags. Also, unlike the standard bags the bags the ones with the Tin are made from a teal like material not to mention the tin makes for an amazing gift. TWG are a company that is based in Singapore so getting the tea bags is going to cost you a little more. If you are seriously looking for an incredible black tea, then this has to be your best option. If I had to choose one traditional black tea as my favorite it would have to be this. It is delicious and has a flavor that is unique and does really stand out from the crowd. While using this as you main drinking tea mightn’t be the best economical choice I would still suggest giving it a try at least once, so you can experience it for yourself. I personally have a box of them in my home for special occasions. 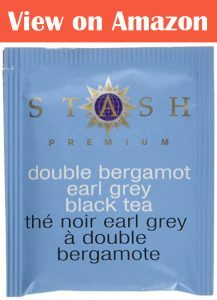 If you are a regular tea drinker and love earl grey tea in particular I would recommend giving Stash Tea a try. Their tea and specifically their earl grey is one of my personal favorites. Each of the tea bags are foil wrapped which keeps them incredibly fresh and you get that real sense of luxury each time before you brew. The unique thing with this tea is its smell, it has an amazing Bergamot smell that really compliments its great taste. Out of all the tea brands I have tried the Republic of Teas packaging is one of my favorites. It could really work well as a gift for a friend or yours truly! My favorite flavor is the Ginger Peach which is surprisingly good. I personally don’t often like teas that have a fruit like flavor – this is because the flavor often tastes artificial and I simply don’t enjoy it. Though with this Republic of tea brew that totally is not the case. 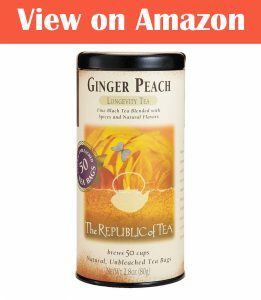 The flavor tastes incredible with a strong and delicious peach flavor and a hint of ginger. The great thing with this tea in particular is it goes well both hot or even iced depending on your mood.